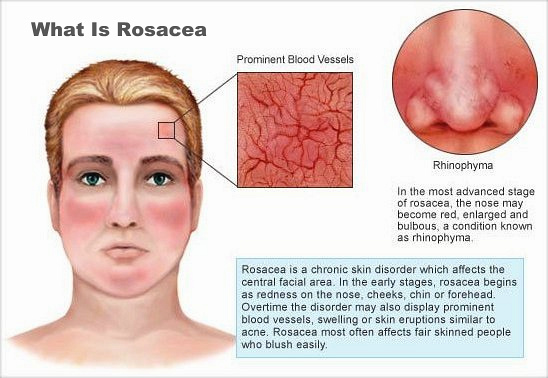 Rosacea, sometimes called acne rosacea (although this is technically incorrect) is a common chronic skin disorder which affects the face. It affects the areas of the face which usually blush such as the nose, chin and forehead. It is essentially different to acne since there are no blackhead spots in rosacea and it is rare in teenagers whereas acne is common at that age. It is commonest between the ages of 35 and 55, especially in fair-skinned people. Rosacea affects women more frequently but is more severe in men. The underlying cause is that the minuscule blood vessels which lie just under the skin of the face in the areas which are prone to blushing enlarge and dilate. Because of this they become visible and have the appearance of tiny red lines across the skin - these are called telangiectasias. Around these lines, pimples or simple spots may also occur. The reason why this should happen is unclear. It is known that stress and emotional events make it worse and that it is commoner in people who are prone to blushing easily. Even a change in the weather - humidity, strong winds on the face - can cause a flare of symptoms. 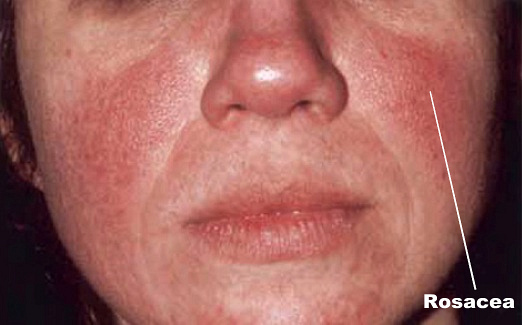 A first attack of rosacea may appear then disappear for a considerable length of time before appearing again, and some people only suffer one attack. For most people however, repeated attacks lead to the skin developing permanent telangiectasia and this gives the characteristic red appearance of the nose, cheeks and forehead. The nose can be dramatically affected in severe cases, becoming red, swollen and enlarged - this is called a rhinophyma and tends to occur in men. The eyes may become rather swollen and red, and have the appearance of a conjunctivitis. 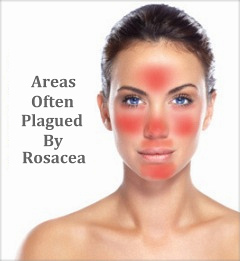 If untreated, all the symptoms of rosacea tend to worsen with time. The diagnosis is made from the clinical appearance alone and no specialised tests are needed here. Rosacea can never be said to be curable, but with the correct treatment it can be readily controlled. It is important not to be tempted to use over-the-counter acne creams or preparations since these only serve to irritate the skin and can make things worse. The treatment of choice is antibiotics, either as a cream or taken in tablet form for long periods. It is often necessary to start treatment at a high dose in order to achieve control of symptoms, and then gradually reduce it down over the following weeks and months. Examples of these antibiotics are metronidazole (you should not drink alcohol if taking this particular antibiotic), erythromycin and clindamycin. The length of treatment depends on the severity of the rosacea but it is usual for many sufferers to need daily antibiotics - either once or twice a day in low doses - to keep their skin clear. Some doctors are also using tretinoin or isotretinoin to see if these are as effective as antibiotics. These are derivatives of Vitamin A which have conventionally been used for treating acne - in rosacea. The telangiectasia lines sometimes require cosmetic camouflage make-up, but can also be treated by lasers to shut down the dilated blood vessels. If a rhinophyma is a problem, surgery is the only treatment. This can be conventional surgery to remove excess tissue or lasers may be equally effective here too. Although not curable, rosacea should be viewed as a medical nuisance rather than a serious medical problem. If treated quickly and correctly, most sufferers have minimal symptoms whilst taking the appropriate medication although this needs to be taken on a long-term basis. • use simple soap and water only. Anything applied to the face (such as moisturisers) should be alcohol-free. • avoid cosmetics which appear to aggravate the condition. • limit your exposure to extremes of temperature, and direct sunlight. • some spicy foods such as curries, and alcohol or hot drinks often make symptoms worse. Avoid these if possible. • if outside on a sunny day, use sunscreens with a high protective factor, such as an SPF of 25. • stressful situations may make the facial reddening worse temporarily. Although never easy, try to keep such situations to a minimum. 1. Have you had previous similar skin problems before? 2. Does anything seem to make your symptoms worse? 3. Have you tried any preparations yourself to try to make your skin better? 4. Do you find it an embarrassment to go outside? 5. Would you be happy taking long-term treatment if you knew it would clear your skin? 1. Are my children at an increased risk of developing rosacea? 2. Is it linked to skin cancer? 3. Is it ever infectious? 4. When would I need to see a skin specialist? 5. If I have rosacea, will I develop acne in the future?